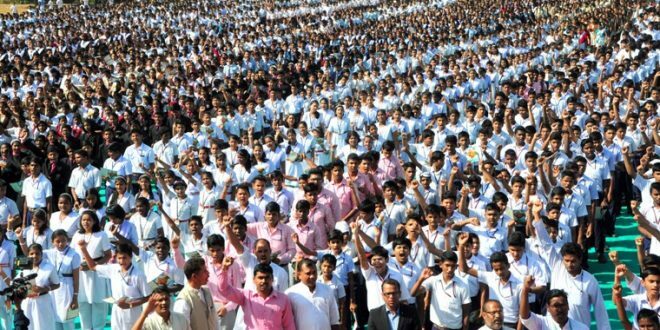 Bhubaneswar: As many as 25,000 students from 30 schools in the twin cities of Cuttack and Bhubaneswar on Monday recited the national song ‘Vande Mataram’ to instill patriotism in the minds of them. The school students gathered at the stadium of Odisha University of Agriculture and Technology (OUAT) at Siripur in the capital city. The first of its event was organized by Initiative for Moral and Cultural Training (IMCT), a socio-cultural organization aims to inculcate nationalism among the youths. This initiative was dedicated to the brave fighters on the border. “Our patriotic soldiers stand vigil on the nation’s borders round the clock, against all odds, in inclement weather ranging from the boiling desert of Rajasthan to the deathly freezing cold in the Himalayas. The guardians of our liberty are unsung heroes who lay down their lives for their motherland with a smile on their lips. So, sharing an hour of us with a noble cause as the singing of the national song is a floral acknowledgment to the soldiers,” said President of IMCT Foundation’s Odisha chapter, Dr. Purna Chandra Mohapatra. Murali Manohar Sharma, Working President of IMCT’s Odisha chapter, said it is important to instill the nationalism and patriotism among the youths. Music maestro of the state, Laxmikant Palit joined the occasion with troops and presented the audiences with patriotic numbers.